BUFFALO, N.Y. -- Not all heroes wear cleats and a baseball uniform... Break out your best princess costumes for Princess Day with the Bisons. The annual event will take place on Sunday, June 24 when the Bisons take on the Lehigh Valley IronPigs at 1:05 p.m. Gates will open one hour before the game (at noon) and Princesses will be available for a meet and greet. 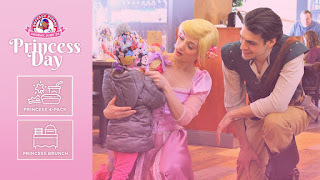 Fans can also sing along with the princesses to their favorite songs and watch Big Board videos that take you through the life of a Princess at Coca-Cola Field. As a bonus, all kids in attendance will be able to run the bases following the game as a part of Kids Club Sundays! Want to save money? Buy your tickets for Princess Day today before it's too late! Families can save money with the Princess Day 4-Pack option. This ticket package includes four Princess Day game tickets, four hot dog/soda coupons, a Princess wand and a Princess Tiara. This package costs $79, a 20 percent off value! Fans can also purchase additional wand/tiara combinations for an extra $10 each. CLICK HERE to order.